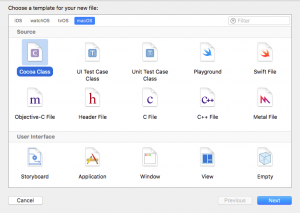 At one time, the only way to create user interfaces for macOS or iOS programs was to use .xib files. Nowadays, the only way to create user interfaces for iOS apps is to use storyboard files. 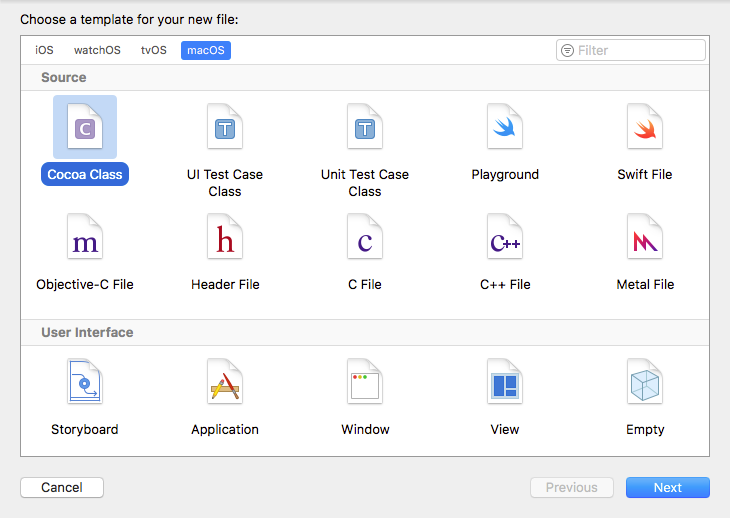 To create macOS programs, you still have the option of using either .xib or .storyboard files, but since storyboards are used for iOS programming, you might as well start using storyboards for creating macOS user interfaces as well. You need to add user interface items like buttons and text fields in the bottom box (the view controller). 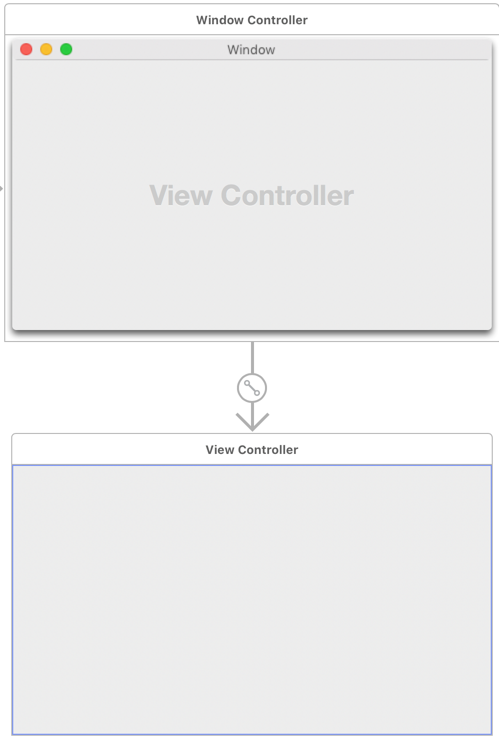 That view controller box is also connected to a class file called ViewController.swift so you can write IBOutlets and IBAction methods to control any user interface items you add to the view controller box. If you want to add another scene to a storyboard, you have to drag a view controller from the Object Library on to the storyboard. 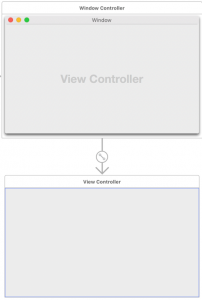 Xcode offers several different types of view controllers such as the plain View Controller or the more sophisticated Tab View Controller or Horizontal/Vertical Split View Controller, which offers more than just a single window to display on the screen. 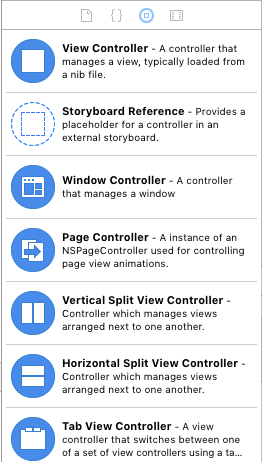 Xcode offers the following types of view controllers you can add to a storyboard. Whatever type of new controller you want to add to a storyboard doesn’t matter but whatever type you add, you must create a Swift Cocoa Class file to control that view controller. 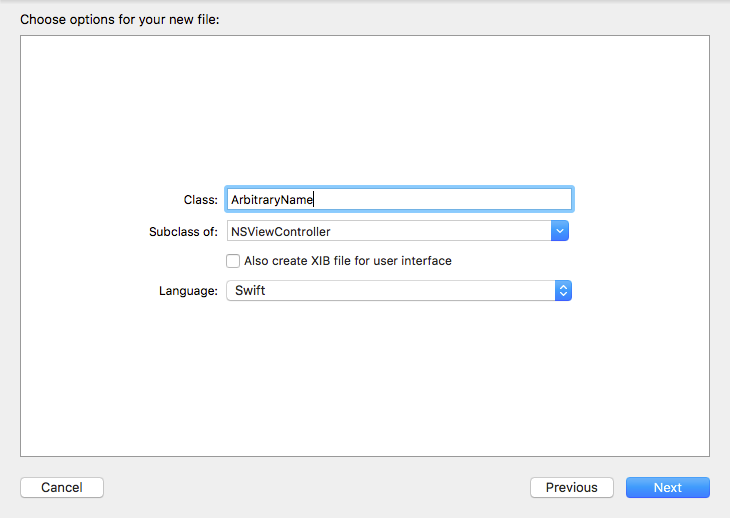 So if you add a View Controller, you must create a Cocoa Class file that’s a subclass of NSViewController. If you add a Page Controller, you must create a Cocoa Class file that’s a subclass of NSPageController. After you’ve added a view controller to a storyboard, you need to choose File > New > File to create a macOS Cocoa Class as shown below. After clicking the Next button in the bottom right corner, you need to give your class file a name (which can be anything, but more importantly, you must choose a subclass as shown below. 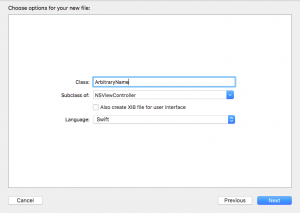 Once you’ve chosen the proper subclass to represent your newly added view controller in the storyboard, the final step is to connect that class file to the view controller in the storyboard. 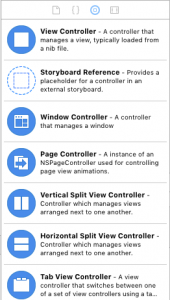 To do this, click on your storyboard file in the Navigator pane and then click on the blue icon at the top, middle of the newly added view controller to select it. Choose View > Utilities > Show Identity Inspector. In the Class popup menu, choose the name of the class file you just created. It’s important to remember that every view controller (scene) in a storyboard needs to be connected to a class file. When you add various user interface items to a view controller (scene), you can open the Assistant Editor and control-drag to create IBOutlets and IBAction methods in the class file connected to that view controller.